The famous Aonach Eagach, above Glen Coe, is one of the best ridge traverses in Scotland, perhaps second only to the terrifyingly awkward Black Cuillin on Skye. It connects two Munros, boasts an anorexic spine and some stomach-churning exposure. Officially the Aonach Eagach is regarded as a 'scramble', which means hands will need to be brought into play in places. However, a few climbing moves are also required and even experienced climbers will use ropes in places. This is not a route for the faint-hearted and both scrambling experience and some climbing knowledge are needed. Prepare to be out for a good five to seven hours and don't be surprised if you have to queue to get on to the ridge in the height of summer, such is its popularity. In the summer months the route is hard enough, but in winter the challenges are magnified ten-fold. When snow and ice are present, it's the solely the domain of he experienced mountaineer. The ridge links two Munros, Sgorr nam Fiannaidh and Meall Dearg and the most popular traverse is from east to west (if you don't fancy doing the ridge, the two Munros can be scaled separately). There are large roadside car parks on the A92 in Glen Coe, just west of the wee whitewashed cottage at Allt-na-reigh. A signposted path climbs north east from the road, rising up the south-east ridge of Am Bodach. It's a fairly steep ascent and the ground underfoot is rocky, providing some early scrambling opportunities. As height is gained, the gradient eases off a bit and the ridge path takes you right on to the top of Am Bodach, the most easterly peak of the Aonach Eagach. From here, descend along the narrow crest of the ridge to a sharp drop where a touch of scrambling is again required as you negotiate The Chancellor, a pinnacle boasting some heart-pounding exposure. This is by no means easy and some will find it useful to use a rope here, although there are good holds in the rock. The excitement is short-lived and the next stretch is straightforward enough. The path leads over a narrow but worry-free crest, rising over a small top before climbing on to Meall Dearg, the first of the day's Munros. It is at this point that the fun really starts. A line of fence posts leads the way over the ridge as it drops into the col below Stob Coire Leith. What lies ahead is the most difficult part of the traverse. It involves a generous measure of scrambling and, in places, the terrain is very exposed. Once you are on to the ridge, the only way off is to retrace your steps to Meall Dearg or progress forward. There are no other escape routes off, so batten down the hatches, take a deep breath and proceed carefully. The exposure in places has made many a strong man tremble. The route negotiates a series of small gullies, rock slabs, pillars and pinnacles. 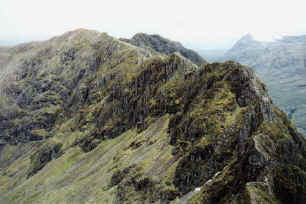 The name Aonach Eagach translates from Gaelic as 'the notched ridge', which didn't take too much imagination on the part of the God-fearing Gaels. You emerge just below the summit of Stob Coire Leith, a short climb taking you up to the summit cairn and a welcome breather and a well deserved pat on the back. From here on, it's plain sailing. The path descends initially and runs level for a way over a ridge which is wonderfully broad by comparison to what has gone before. 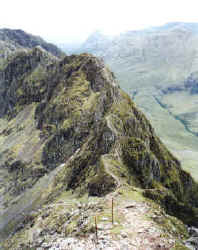 The path rises through rocks to the top of Sgorr nam Fiannaidh, but it's an easy ascent. Savour the views, then prepare for the final descent. The most direct route down is via a steep ankle-grinder of a path which drops due south through scattered rock and stone to the Clachaig Inn. This is not a particularly pleasant route, but it's direct if nothing else. An alternative is to head west towards the Pap of Glencoe which is well worth taking in for the views west and north east down to Loch Leven and over to the Mamores in the north. This route joins a much more obvious path lower down which skirts through grazing land to emerge on to the minor road a couple of miles short of Glencoe village. Distance 6 miles (from starting point to Glencoe village). Maps OS Landranger 1:50,000 sheet 41 or Harveys Glen Coe. Start/parking Car parks west of Allt-na-reigh (grid ref 173568). Grading A traverse suitable for experienced scramblers with some rock climbing experience only.